Nijmegen is the first university in the Netherlands with a bachelor programme in Cyber Security. Find out more information (in Dutch) and consider joining! A top Master in Cyber Security is jointly organised with the Technical University Eindhoven. On Feb. 21 2019, I gave a talk at the Royal Institution in London about Electronic Identities in Europe, see the online video. My research concentrates on theoretical and practical aspects of security. On the theoretical side, my focus is on quantum logic and probabilistic computation, supported earlier by an ERC Advanced Grant, see also the EfProb Python library for probabilistic computation. On the practical side, I'm interested in identity and privacy management, see eg. the IRMA project and video on attribute-based authentication and signing, in security and privacy in personalised medicine (see the PEP technology), and in cyber security and intelligence and the broader societal aspects of computer security, see also the new interdisciplinary iHub that I am setting up for Security, Privacy, and Data Governance. Publications: papers (local list with downloads, or Google Scholar list with citations), recent talks, but see also press contacts and online videos. I am an editor of the journal Theoretical Computer Science (see at ScienceDirect). a 3ec computer security bachelor course Privacy and Identity, in the spring, together with Merel Koning. I participate in the TRU/e master programme in cyber security, together with the Technical university Eindhoven. It is highly recommended! I am member of the research group Digital Security, and of the Privacy and Identity Lab. If you are interested in studying computer science at Nijmegen, have a look at our information website (in Dutch). Recipient of an ERC Advanced Grant in 2012, on Quantum Computation, Logic, and Security, see the project webpage. Practical work: IRMA and PEP. There is a wikipedia page about me (in Dutch), containing some basic biographical information. Member of the (Informatics section of the) Academia Europaea since 2012 (see my personal page there, at the AE). Member of the Koninklijke Hollandsche Maatschappij der Wetenschappen (KHMW), since 2013. Member of the National Cybersecurity Council. Member of the board of experts (Kenniskring en tegenspraak) of the Review Committee on the Intelligence and Security Services (Commissie van Toezicht op de Inlichtingen- en Veiligheidsdiensten, CTIVD). Founder and chair of Privacy by Design Foundation, a non-profit spin-off that focuses on privacy-friendly attribute-based authentication. Ranked by investigative journalism website Follow the Money me as most influential cyber security expert in The Netherlands, in 2017, see ranking and follow-up interview. Recipient of the Dutch order of chivalry: Officer of Orange-Nassau. Winner of the SURF Security en Privacy Award 2017. 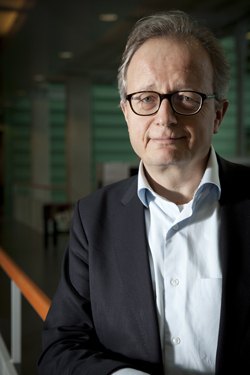 Recipient of the 2012 Huibregtsen award, for Science and Society. For this occasion a special short video has been made (by Andries Udink), see also wetenschap24 for more information.